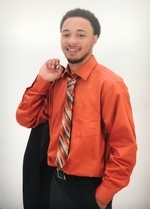 Joseph Edward “Lil Joe” Bowser II., died suddenly on Friday, March 23 at the age of 22. Joe was born on February 10, 1996 in Battle Creek, Michigan to Tracey Cummings and Joseph Bowser I.
Joe graduated from Battle Creek Central High School class of 2014 and was a student in the School of Engineering at Western Michigan University with expected graduation 2019. He worked part-time for Remington Car Wash and along the side of his father at Pitman Painting. Joe’s last work assignment was painting at Kingdom Builders Worldwide Church in preparation for opening on Easter Sunday. Joe was very intelligent, a member of the National Honor Society, a student who loved a challenge and was a great problem solver. He had such a fun, loving, caring spirit and enjoyed helping others without hesitation. His big contagious smile was everlasting once you met him you to would be smiling. He touched and inspired so many people and received so much love in return. Joe enjoyed shopping and was an avid “Jordan” shoe collector. If you knew Joe he wouldn’t leave without that “IPhone” that was never charged, while listening to the beats of Hip Hop music. Joe was well-rounded, respectful, and a kind hearted young man with a promising future. A dedicated athlete who loved soccer, football, basketball, and track, you name it he could do it! He especially loved his sisters as well as hanging out with his “brother-cousins” Ahmed, Khylen and Chris. His beautiful life will forever be cherished in the lives of his parents: Tracey Cummings of Lansing, MI and Joseph E. Bowsers I. of Battle Creek, MI; sisters, India Bowser of Astoria, NY, Alexia Bowser and Jayani Randle both of Battle Creek, MI; grandparents, Richard and Janet Cummings of Lansing, MI, and Maxine Small of Battle Creek, MI; and a host of aunts, uncles, cousins, and friends. Joe was preceded in death by his grandfather’s Melvin E. Bowser III and Chester Clark I. His influence will forever remain in the lives of all who knew him.